The West claims that the Kurds are one of the most moral and dignified forces in the Middle East fighting against Daesh. But if their focus is on defeating Daesh, as they claim, why are they committing genocide against Syrians in the process? Taking this into consideration, it is hard to justify the West’s persistent claim that armed Kurdish terrorist groups are trying to help Syria. The reality on the ground contradicts these empty compliments, which the West uses to save face while supporting these terrorist organizations. This false narrative was in fact used to arm the Kurds in Syria in order to create instability and division. For separatist Kurds to claim an area that they have lived in or have liberated as being rightfully theirs defies international law and logic. Al-Muatasim is known to be a strong ally of the U.S., which is why it was chosen to be in charge of the designated villages. 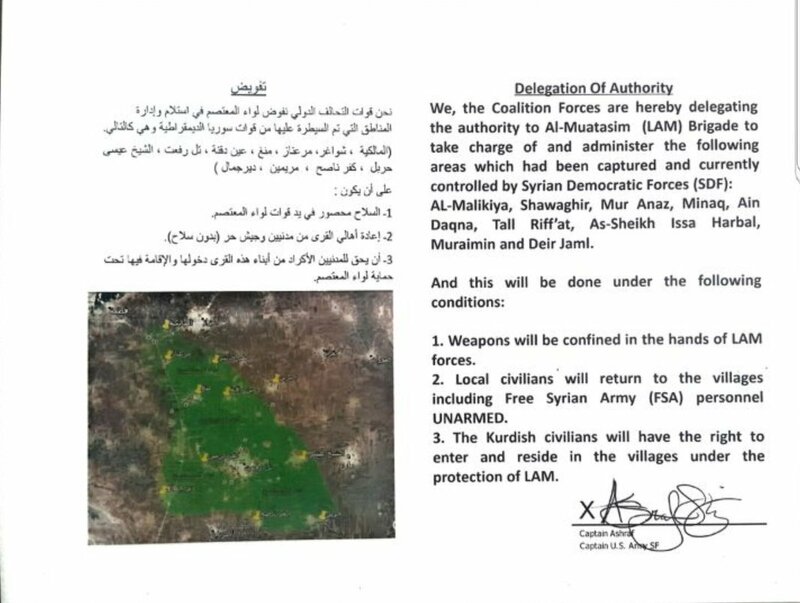 This further proves the point that the U.S., SDF, and FSA are still working together. Their cooperation is part of an effort to counter the progress being made by the Syrian Arab Army and its allies. 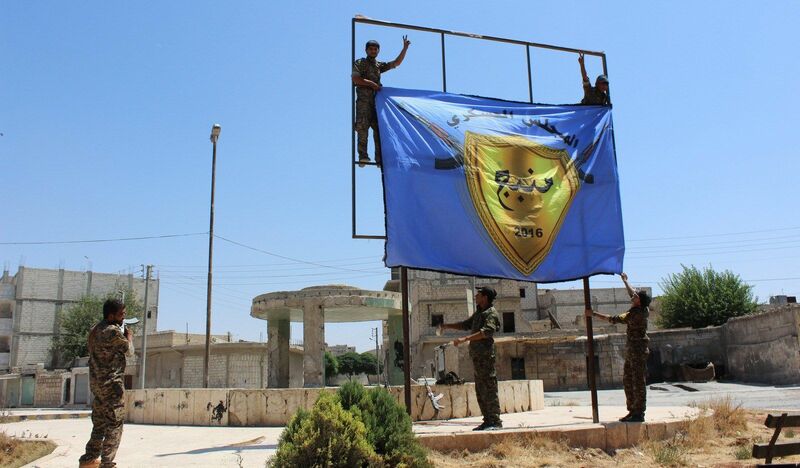 The leaders of the SDF announced that they’ll try to annex the majority-Arab city of Raqqa if they manage to liberate it. The Kurds are ethnically cleansing Arabs from Raqqa en masse in order to pave the way for the city’s annexation to their unilaterally declared “Federation” after its forthcoming capture. Brilliant article as always, Sarah! Where is the UNZioNa*i or ICCZioNa*i to stop this increasing GENOCIDE and LAND/PROPERTY-ROBBERY of Syria-Iraq’s Indigenous Sunni-Shia Muslim/ORTHODOX Catholic Arab/Turkmen/Persian/Assyrian/Aramean (Syriacs)/Armenian peoples – by the rogue and most evil NA*O-US/ISra*l-backed Kurdish terrorist OCCUPPIERS, especially the most evil murderous PKK drug gangs, rapists and robbers and its branches, SDF/YPG/PYD/KDP/KRG; under the pretext of fighting IS (this is why the Kurdish TERRORISTS with their collaborators, MOSSAD/CIA-created IS/ISIS/ISIL, purposely destroyed all houses and buildings to pieces, in areas that they conquered, in Iraq and Syria, so it can be claimed subsequently, falsely as “Abandoned property/land”, to be confiscated by the Kurdish Terrorists for the expansion towards their illegal ‘Kurdistan’; just like colonial ISrael)! p.s. I was a pathetic fool to be duped by the so-called Kurdish victimhood false stories in Europe , and wrongly became anti-Turkish, as I was duped into worshipping blindly the so-called Zio Western-feminism and wrongly became anti-Islam/anti-Muslims; but NO MORE! I have woken up finally to the real truths! I also think the Syrian Govt. need to correct its mistake by being duped by the most evil NA*O-US/ISra*l-backed Kurdish terrorist OCCUPPIERS – where they also I suspect have infiltrated the Syrian Govt. Hence, I think Pres. Assad need to work with Pres. Erdogan, and with Russia and Iran – to defeat this most dangerous NA*O/US-ISra*l-backed PKK drug gangs, rapists and robbers and its branches, SDF/YPG/PYD/KDP/KRG; before Syria became like rogue colonial ISrael; where the Indigenous Palestinian Muslims and Orthodox Catholic are being annihilated especially in Gaza by the Mediterranean Sea, and in the West Bank by the Dead Sea (the Zionist TERRORISTS don’t want the Indigenous Palestinians to have any access to any sea – hence they can be imprisoned forever in Concentration Camps)!